Following my time working for government in Australia, I then worked as a researcher and policy adviser in the Greater Mekong Region for the Worldwide Fund for Nature on climate change adaptation and sustainable development. From 2013-2016 I was a consultant researcher for the climate change group at the International Institute for Environment and Development. A selection of the research and policy work I undertook at these organisations features below. 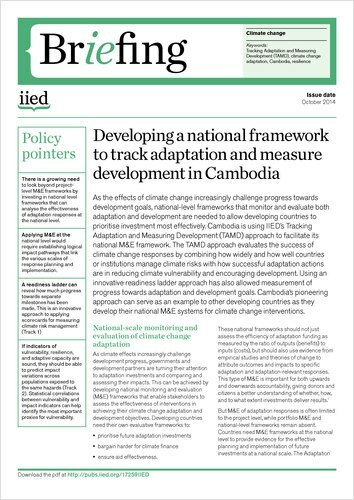 This report records how Cambodia is implementing its national monitoring and evaluation (M&E) framework to measure the performance of its national and sectoral responses to climate change, using IIED’s Tracking Adaptation and Measuring Development (TAMD) approach. Because climate change affects vulnerability, the way in which a country manages its climate risks is inextricably entwined with its ability to achieve development. This briefing explores the way in which the Tracking Adaptation and Measuring Development (TAMD) framework uses simple techniques such as scorecards and baselines to help countries evaluate how well its institutions are managing climate risk at all levels, and how ready they are to address emerging risks. TAMD can be adapted and applied to different contexts and scales, to identify where countries need to target additional institutional support to help them achieve climate-resilient development. As the effects of climate change increasingly challenge progress towards development goals, national-level frameworks that monitor and evaluate both adaptation and development are needed to allow developing countries to prioritise investment most effectively. Cambodia is using IIED’s Tracking Adaptation and Measuring Development (TAMD) approach to facilitate its national M&E framework. 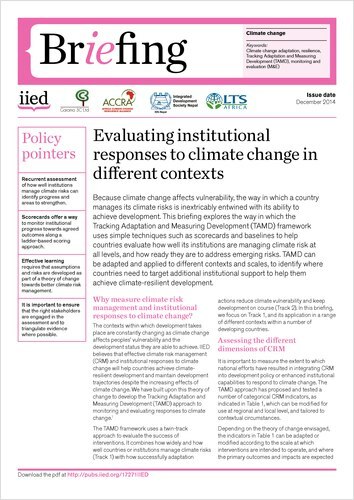 The TAMD approach evaluates the success of climate change responses by combining how widely and how well countries or institutions manage climate risks with how successful adaptation actions are in reducing climate vulnerability and encouraging development. 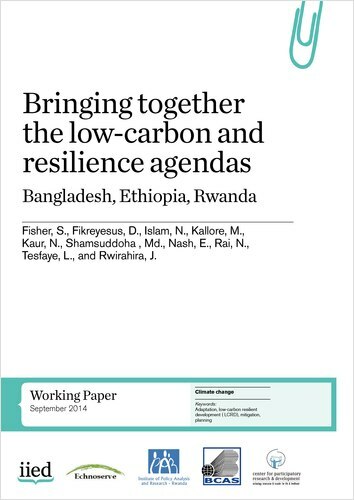 Bangladesh, Ethiopia and Rwanda are at the forefront of developing national plans that address elements of both climate change mitigation and adaptation with a low carbon resilient development (LCRD) agenda. This working paper explores the experience of LCRD planning in each country using stakeholder interviews, analysis of policy documents and surveys to understand how this agenda is emerging in practice, and what ideas and discourses are shaping the policy development. Establishing a national consensus on what is understood by LCRD is shown to be important in building stakeholder support for any proposed LCRD agenda, as is clearly defining which co-benefits are being targeted. This country report provides an overview of the three key dimensions of Rwanda’s planning system – policy frameworks, financial mechanisms and institutional arrangements – and explains how lowcarbon resilient development is being integrated into each of these components. 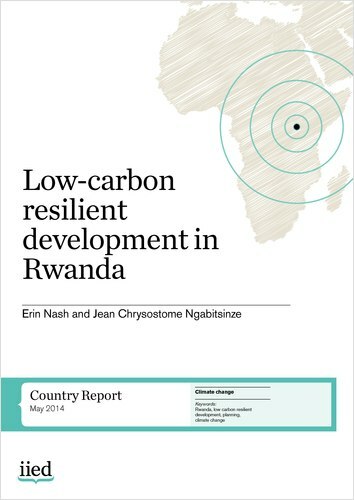 Rwanda is an early adopter of low-carbon resilient development and therefore provides an example of how national governments are working towards climate resilient planning in different contexts. We created this framework to support the development of Ecosystem-Based Adaptation responses to climate change, and to assist with the mainstreaming of such strategies into policy and planning across the Greater Mekong region. The framework can be downloaded here. More information about the project can be found here. This report summarizes an evaluation of the combined impacts of climate change and non-climatic threats on communities and the ecosystem goods and services on which they depend within the Mekong Flooded Forest in NE Cambodia. Through both community- and expert-based elicitation, this report uses ecosystem-based-adaptation approaches to identify strategies to improve the resilience of the human communities in the Mekong Flooded Forest.